Larry Richman and I are good friends. We must be. He keeps sending me personal emails giving me clues into what the web team of the church is doing these days. I think he must have told Joel Dehlin, the CIO of the church about me because he also sends me his emails. They are most informative into understanding how the CIO of a large organization thinks. We go way back - to almost five months ago when I signed up to receive their emails. You can too. Anybody can. I mean no disrespect. Larry and Joel take their work seriously. I think they have some of the hardest jobs in the church. I am convinced that the Internet outreach of the Church is only going to grow in the years to come. That means that the web team needs to grow. I'm sure you've seen their ads on the bulletin board at the church. Larry is so busy he is looking for another manager (posted 28 Feb 08). You can find lots of church tech jobs at tech.lds.org. I wanted to work for the church once. A long time ago when I still made a living as a programmer, I applied for a programming job at Church headquarters. I was surprised when they called me up and said they would like to interview me. "But I live in California," I said. I was even more surprised when they sent me a round trip ticket to come up for the interview. I think this was back when the church had some connection to the old Western Airlines. The interview went well, I thought. We even discussed my first project - writing the interface for the point of sale system for the Mormon Handicraft store that stood across from the Church office building. So I moved my family up to Salt Lake and showed up in the personnel office on a Monday morning. "What are you doing here?" they asked. "I'm here to start work," I said. "Oh, sorry. We just sent you a letter. We hired someone else who already lives here." My mistake. I was young and naive. There was no job offer. I only thought there was. No problem. I went to work for Management Systems Corporation down the street. I knew computers well and sold Apple Computers in their retail store. I was there during the big State street flood during the spring of 1983. Remember the floods? I had a blast in Utah for a year. My son was born there. But times were tough and we soon returned to sunny California. Now I work for the Church again. No, I'm not an employee of the Corporation of the President. My sister is though. She works for an Apostle. I'm real proud of my big sister. She has done well. I've always heard that you can't make much working for the church. The standard line is that it is a labor of love. I'm told that things have changed in the tech arena. So if you have tech skills, especially in web development, give them a call or send them an email. They're hiring. I work for the church in that I take Elder Ballard's invitation to share the gospel via the Internet very seriously. I strive to write posts that shed a good light on the church. Sometimes I will take a current criticism of the church from the news and write my take of it in such a way that I hope is helpful to someone who is not a member of our church. Don't get me wrong. I love a good dialog, but I prefer a discussion of doctrine over a haranguing from a Mormon basher. Larry sent me an email today pointing out an article on BYU Newsnet, "Called to Blog: Fighting for the Church Online." There is a great quote from Richard Holzapfel, a BYU professor of Church History. Holzapfel said that the way the gospel is being spread has changed. Missionaries used to go to islands by boat. Today, things are completely different. People search for information about the church online. "One of the ways they're going to come to the gospel is through the Internet." The More Good Foundation was founded by Jim Engebretsen, assistant dean of Corporate Relations at the BYU Marriott School. 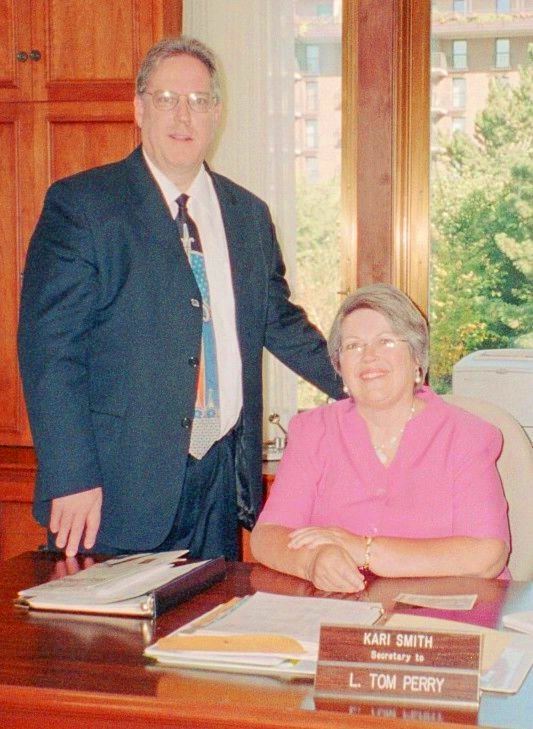 Jim served as a mission president in Oklahoma from 1998 to 2001. Missionaries told him they were being turned down after investigators searched about Mormons on the Internet and found anti-Mormon websites. Engebretsen decided that something needed to be done and started the More Good Foundation in 2005. If you would like an easy and friendly place to answer Elder Ballard's invitation to start blogging. check out the More Good Foundation's lds.net. It is kind of like MySpace for Mormons and already has nine thousand members. 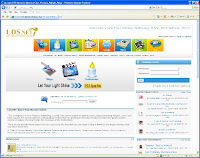 This online network combines blogs, chats, forums, photos, and videos. People don't go to their neighbors like they used to. Instead, people Google things. The Internet is where many people will go to find answers to religious questions as well. I have found that to be true. I get so many hits from Google. I can see that people are looking for information about the subjects I have previously written about. You can watch the hits come in on my little sidebar widget. I just wish more people would leave comments, especially honest seekers after the truth. So far, most of the comments are from good faithful members or, on occasion, from a professional Mormon basher. What kind of reader are you? Leave a comment. I found your blog while just looking around a few weeks ago, and I have been a regular peeker ever since. I enjoy your writing and insight. Thank you for giving me things to think about. I hope you don't me dropping in. Just a visitor off a feed. Leaving a comment since you asked for one. Here is the beauty of blogging. I would have probably never found or read your blogs if you hadn't left a comment. Each of your blogs is wonderful and fascinating. I just spent an hour reading your current and past entries. Grandma Labrum, I enjoyed your posts and checked out the blogs of some of your children - one blog is inactive and one is by invitation only. I just had to go back through all your comments on The Peacegiver by James Ferrell. I had not read it but almost feel like I have after reading your comments. Thanks for sharing those. Clean Cut - You have a wonderful family. I can relate to your comments about teaching. I also taught seminary for a number of years. I also am waiting to hear more of the mystery behind the sudden resignation of Craig Jessop. I agree with your assessment of Jeff Lindsay. I have read him for many years, even before he started blogging. It was his blogging that got me started. Thanks for the comment. Stephen, I'll never be able to get through all your stuff but now I know you a little better. I've read many of your posts in various places over the years, including your post today on Trials on Mormon Matters. Thanks for your work on FAIR. I have long been a fan. And thanks for stopping by. Aloha- your job sounds pretty cool. Just wanted to say HI! This is a great post, Tim. Here's another comment for you, and also a shameless plug to everyone to come on over and visit my little site! Then miraculously two weeks later Elder Ballard's groundbreaking "call to blog" talk took place. To me, it was my direct answer to "go forth with faith". It has been a wonderful journey and I am learning new things every day. I admit, it is also easily my worst addiction and something that can take over your life if one is not careful. All new bloggers-to-be, consider yourselves duly warned!! "We will stand as witnesses of God at all times, and in all things, and in all places"
You wrote, "We will stand as witnesses of God at all times, and in all things, and in all places. I believe one of the most important of those places today is the World Wide Web." I couldn't have said it better. I spend my life on the computer because I work from home supporting my co-workers via email and Remote Desktop. I am always online and always reading something about the church or religion in general. I have long wanted to see more good LDS content on the web. The church is doing a lot but the call from Elder Ballard was just what I needed to wake up and open my mouth or my fingers in this case. It is my desire to provide that good content I had been searching for. Thanks to my good friend Tim Malone for this blog. He's a great defender of the faith, smart, and eloquent.